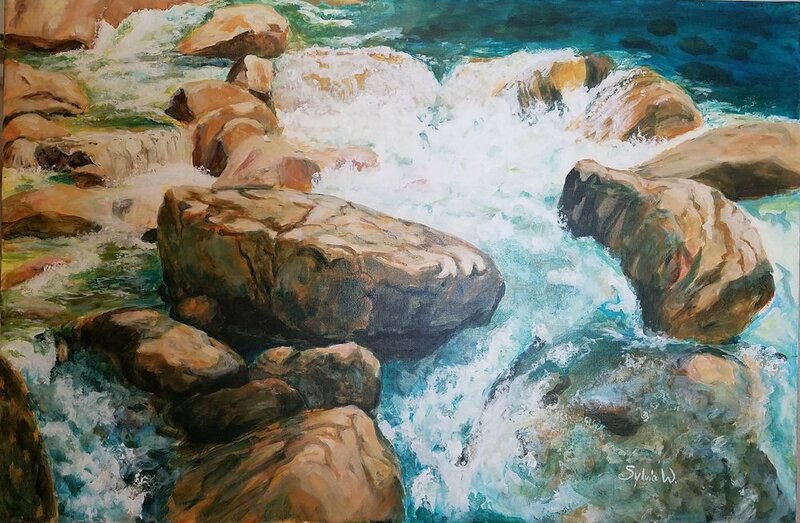 Here is the third in my series of Rocks and Water paintings in acrylic. I am still really enjoying the process of glazing over a monochromatic underpainting. There were some elements in this one which didn’t come out quite as planned, and yet others which came out better than expected! I like the fact that so long as you don’t get too dark too soon, you can keep going back in and adjusting the temperature, color, shape etc. Its very satisfying. I hung this one on my wall for a few weeks before varnishing, just to make sure I was happy with most of it. I took it down several times to make minor adjustments. I could probably have gone on forever doing that…..!